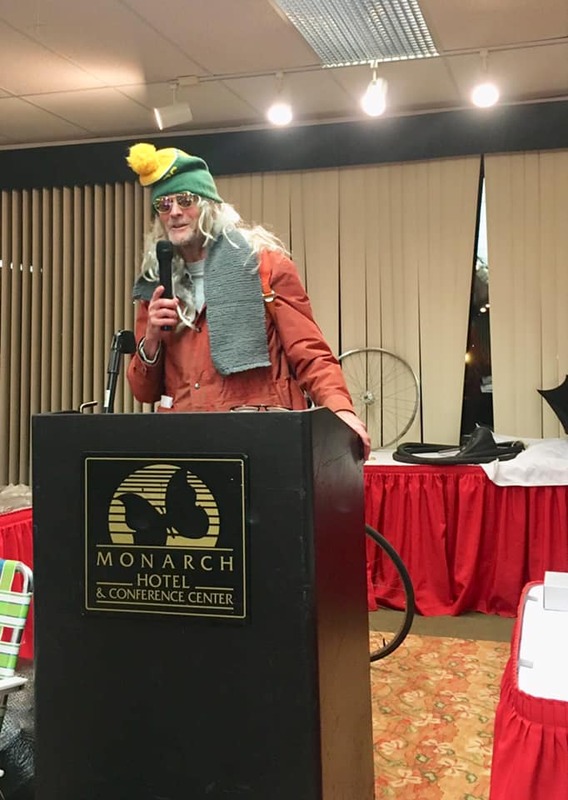 If you missed the Awards Banquet on January 27, you missed some great entertainment! You may also be eligible for a prize or two. Contact Bud Rice to claim your pin or mug or special award. And HERE is a link to the program for the evening. Doug Meyers as “Dusty” – Click photo for more FB pics! Mileage awards begin at 500 miles and go up to the 1,000s. If you have surpassed the 2000 mile mark in 2018 you have earned a coffee mug that says you have ridden 2000 miles, or 3000, or 10,000 miles, or whatever 1000 mile mark you have reached, beyond the 2000 mile point. And for those really serious mileage hogs, the club awards a mileage plaque to signify reaching each 10,000 mile plateau. And if you have led rides, you earn (in past years) bicycle socks, a water bottle, or a coin purse. If you lead 12 or more rides, there’s another prize! It’s time to be thinking about nominating your deserving fellow riders for some special awards. Now is the time to be looking around at your fellow riders who might deserve special recognition, not December 31 (the deadline). The Jim Mooney Award (Member of the Year) 1) Must currently be a member in good standing and have been active in the PWTC for at least 3 years prior to the year of the award. 2) Must have ridden at least 1000 miles in the year for which the award is presented. 3) Has served as a ride leader sometime during the year for which the award is presented. 4) Participated as an event volunteer in at least one special event during the year for which the award is presented. 5) lf Board Member, contribution exceeds that of assigned duties in promoting PWTC. Valued Member Award (two may be given): 1) To be eligible a member must have contributed to PWTC in an outstanding manner during the year for which the award is presented, but member may not meet the qualifications for Member of the Year Award. Volunteer of the Year (one given) Member in good standing who has contributed in any of the following capacities: event coordinator; working volunteer for any event (but not necessarily coordinator); active Ride Leader; held either board or committee positions; or participated actively in club activities. Nominee’s recognition can be for one outstanding contribution or as an ongoing participant. Award is not restricted by length of membership. Ride Leader of the Year (one given): Recognition of member who has exceeded in adhering to the guidelines set forth in the Ride Leader Check List. Has conducted themselves in a conscientious and friendly manner, showing knowledge of the route, presents themselves as an ambassador for PWTC by welcoming non or new PWTC members at rides. Newt Acker Good Will Ambassador Award Member in good standing whom within the past year has helped to enhance the friendly image of PWTC within the community. Come Back Award Member who has suffered injury while cycling, yet came back with style and determination to resume cycling within that year. Most improved Rider (multiples given) 1) Be a PWTC member in good standing for 2 years or more. 2) Must have ridden 500 Club miles or more for the year for which the award is presented. 3) Has shown improvement in different types of distances and terrain within their riding capabilities. Most Improved New Rider (multiples given) 1) Joined PWTC in year of award or previous year, but no later than October and rode under 500 miles the previous year. 2) Must have ridden 500 Club miles or more for the year for which the award is presented. 3) Has shown improvement in different types of distances and terrain within their riding capabilities. Click HERE to open a document showing past recipients of the awards.